Hero In French Train Attack, Spencer Stone, Stabbed In California : The Two-Way Stone, one of three Americans who helped stop a terrorist attack on a Paris-bound train in August, is said to be in stable condition following the incident in Sacramento. 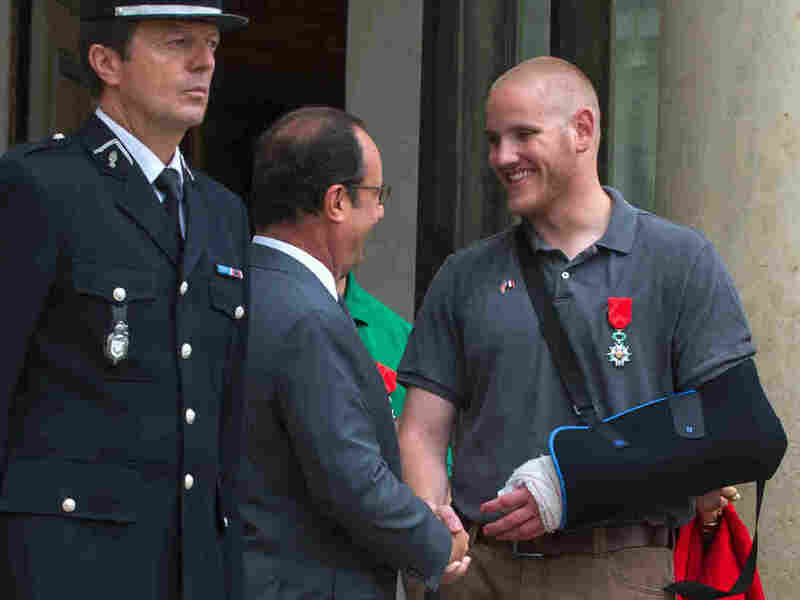 French President Francois Hollande shakes hands with U.S. Airman 1st Class Spencer Stone on Aug. 24 after Stone and two friends were awarded the French Legion of Honor for subduing a gunman on a Paris-bound train. Spencer Stone, one of three Americans who thwarted a terror attack on a Paris-bound train this summer, was stabbed early Thursday morning in Sacramento, Calif., according to an Air Force spokesman. Lt. Col. Christopher Karns said he had no details on the circumstances surrounding the stabbing, according to The Associated Press, and that the incident was being handled by local law enforcement. NPR's Richard Gonzales says Stone, 23, is reported to be in stable condition. According to a statement from the Sacramento Police Department, the victim was stabbed multiple times in the upper body. Police did not identify Airman 1st Class Stone by name in the statement, saying that they "respect the identity of all crime victims." "On Thursday, October 8, 2015, at 12:46 a.m., the Sacramento Police Department received a call from a passerby that a subject had been stabbed in the area of 21st Street and K Street. "The victim, a man in his 20s, was located on scene and transported to an area hospital by fire personnel. "It is believed that the victim was out with a group of friends when a physical altercation led to the victim being stabbed multiple times in his upper body. Detectives were called to the scene to assist with the investigation and the victim is currently being treated for what appears to be non-life threatening injuries." Sacramento police later tweeted that the stabbing appears to be alcohol-related. Stone, 23, sustained serious injuries when he subdued the heavily armed man on the French passenger train. He was slashed by a box cutter and required extensive surgery on his thumb. He also suffered injuries to his right eye and arm. As we reported, Stone and the other two Americans — Oregon National Guardsman Alek Skarlatos and Anthony Sadler — were honored last month by President Obama in the Oval Office.